I want to preface this post with the disclosure that I am horrible at keeping a clean house. I fail in this area so much, so I want to get that out there so you know that I’m in the trenches with those of you who struggle here. But, I can tell you from experience that keeping a clean home has many benefits, several of which are spiritual benefits. Whether we like to admit it or not, our environment and those things in it can really affect our moods and those members of our family’s moods too. Even our own attitudes can affect our children greatly. Think about it. When someone around you is angry, doesn’t it just make your skin crawl and make you feel icky? But it’s not just our attitudes that can affect our family. It’s also the other things around our home, in our neighborhood, and even in the world as a whole. This is why we fight so hard to make our homes a haven for our families. Because the world does affect us, and right now the world has a whole lot of hate that impacts kids in a variety of negative ways. While we can pray for the world around us, the place we can have the most immediate and lasting impact is in our own homes. We can make it a place which cultivates an atmosphere of peace or inadvertently a place that feels chaotic and stressful. While we’re focusing more on the spiritual side effects of a dirty home in this post, I want to touch on the effects that a dirty home can have on your health. The reason being that if we are in bad health, we are distracted by our illness and weakened physically, which in turn can impact our spiritual lives as well. When we aren’t able to have control over our flesh, we can find ourselves giving into temptations easier because we just don’t have the energy to fight it. Now, having said that, I think there are two very far ends of the spectrum here. There are those who believe that every spec of dirt will get your kids sick. This just simply isn’t true (my kids hardly ever get sick and we don’t have even close to an immaculately clean home). But, dirt and grime can cause your family to get sick in some circumstances and if it’s bad enough. This is especially true of dirty dishes with old food hanging around and issues where mold becomes involved. So just keep this in mind. Don’t go overboard, but just remember that our families need clean homes in order to have healthy lives. How do you feel when your home is dirty? When the dishes are piled high, the laundry hasn’t been done in weeks, and the kids are crawling around in dirt, how does this impact your own feelings? Be honest here. From a personal standpoint whenever our house gets out of control I feel extremely on edge and stressed out. Do you feel that too? I actually came up with a strategy that helps me a lot. I might not be the best housekeeper, but I have a list of two things that minimally have to get done everyday in order for me to not go crazy. So long as these two things are done, everything else seems to fall into place better and I am SO MUCH less stressed. My two things are having the dishes done and the kids’ toys picked up before bed. Waking up to those two things being done makes a world of difference in the outlook of my day. I once heard someone say that doing dishes before bed is like giving your future self a gift. The same could be said of cleaning your home today. It’s like giving your future self (and for that matter your family) a gift of peace and calm. So we keep a clean home (note: not a perfect home) to help cultivate a place of peace and calm. A clean home helps you, your husband, and your kids, to relax. There isn’t one more thing to do staring at you in the face. There isn’t a smell that permeates to your brain and gives you a headache. And there isn’t chaos all around you. Only peace. These things make a big difference in the attitudes of those in your family. And when attitudes are good, there is more of an open door for goodness and peace to come in. And I find that when there is more peace around us, we tend to bear more fruits of the spirit and are more focused on serving God and less on the chaos around us. So keep these things in mind as you scrub toilets and carpets and all manner of surfaces that seem to get grimed up so easily. 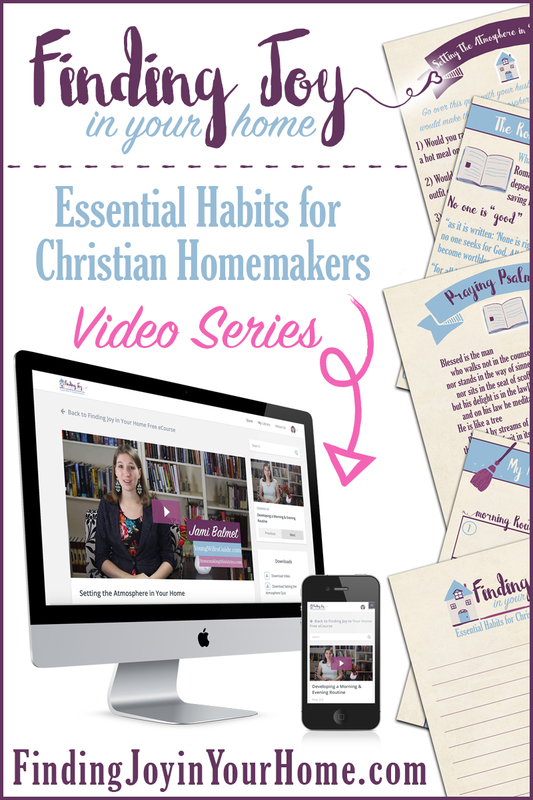 Keep in mind that you are a homemaker for the glory of God. And you do this for you and your family to have a calm and welcoming place of peace and refuge. A place where stress, anxiety, and frustration are not the tone of your home. But rather peace, love, and joy.